The right conveyor solution can help your operation run more smoothly, and you want the best value possible. How do you optimize your solution to ensure you get the most from your system? Inspect the conveyor for any abnormalities— Remember, if something looks “off,” it’s a good sign that it needs attention. 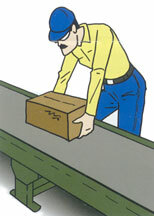 For example, if the chain on your conveyor is wearing unevenly, it may be misaligned. If the belt conveyor cover swells in spots or streaks, check for oil, acid or other substances, and make sure the idlers aren’t being over-lubricated. Take your motor’s temperature— A temperature spike can indicate your motor is working too hard. Make sure it’s doing the work it was designed to do. Make sure your parts are available— Keep key components available to reduce downtime when a part needs to be switched out. Perform systematic conveyor maintenance— You’ll help prevent downtime and prolong the life of your conveyors. Keep your conveyor is clean— You don’t need to wash it every night, but you do need to make sure it isn’t covered in shipping labels and tape. Some types of waste can get into rollers and belting and cause issues. Dust and debris buildup can cause friction or failure, and also can have an effect on worker morale and even safety. Does your product change substantially each season or on any other regular basis? What types of pallets will you be conveying? Will you be conveying any powdery materials, such as flour, that could require extra maintenance? What about oily parts or moisture in the product itself? Before installing a conveyor, know the upper and lower limits of the unit. 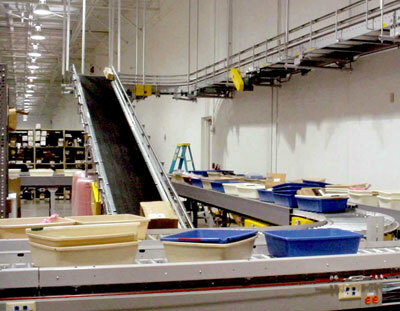 Conveyors are designed to transport specific products; make sure to consider the product and application for each unit. For heavy and bulky materials, consider a pallet handling conveyor. For smaller packages, you may want to use a belt conveyor. Any Hytrol integration partner can assist you in this process. A good primer on load data can be found here. Testing your system is crucial to its overall performance. Is it transporting your product smoothly, or are there hang-ups? It’s important to know how the conveyor is running—especially if you have new SKU’s in your mix. Make sure your equipment is running at appropriate rates. If there are issues you may need to talk to an expert integration partner to help you find a solution. Work surface height— This is the height of the conveyor belt or roller from floor level. Avoid making operators stoop to pick up a box; it will ultimately take more time and cause more wear and tear on your workers’ joints. Reach distance— This is the distance the operator has to reach for the product. If your conveyor is too wide, he or she will need to reach across the conveyor—at worst, this can cause immediate accidents. The working height— This is the height the operator holds his or her hands to perform the task. If you have a tall product, you want your worker to be able to grab it at its center of mass, so avoid putting a 6-foot box on a 4-foot conveyor. Educating employees about safety around material handling equipment can save you money down the line, and creates an environment where your workers feel valued. Train for both safety and operations in equal proportions. Workers should know how to approach the conveyor; how it will behave; how they are expected to interface with it; what they’re supposed to do (and not supposed to do). They should understand emergency stops, how to start the system, and how to deal with any advanced features such as sortation or accumulation. They should know its tolerances for weight, size, and load types. Training of different operations ensures that the equipment is being used properly and at the rate it was designed to run. Do you have an old, worn belt? Replacing your equipment before it breaks down is an important step to decrease downtime and keep your operations working smoothly. Not only that, but you can make sure to utilize the most current technologies in your upgrades and see cost savings when you work with more efficient motors and drives. Your conveyor is a large investment that you want to see put to the best use possible. Make sure it is when you follow these steps for optimization. This post was authored by Paige Carswell, Marketing Specialist at Hytrol. Paige joined the team in June of 2014. She works with the Marketing Department to nurture sales leads as well as provide educational content about Hytrol and Hytrol equipment for Integration Partners and end users. You may contact Paige at pcarswell@hytrol.com.